City has hosted a launch event to kick off the second year of IFSTAL - the Innovative Food Systems Teaching and Learning programme. IFSTAL was set up last year to bring together postgraduate students from different universities and disciplines to address global food challenges. The free programme allows students to explore real-life problems facing a wide range of organisations working on food issues. It also gives them the opportunity to broaden their learning experience and network with students and academics from other universities and subjects. The IFSTAL team hosted a joint launch event at City with colleagues from the Leverhulme Centre for Integrative Research on Agriculture and Health (LCIRAH), a research consortium comprised of the London School of Hygiene & Tropical Medicine, School of Oriental and African Studies and the Royal Veterinary College. Professor Martin Caraher from the Centre of Food Policy at City and Dr Barbara Haesler from the Royal Veterinary College and LCIRAH chaired the public event. 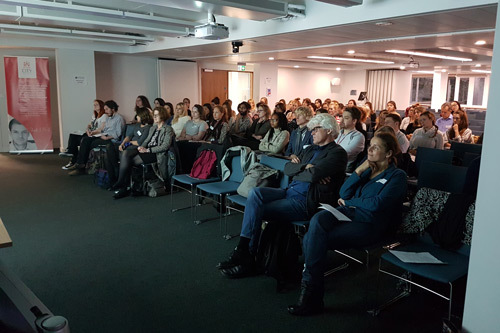 A live stream linked to the other parallel launch events across the country at the other IFSTAL partner institutions: Oxford University, Warwick University and Reading University. This was followed by a local panel discussion at City, led by Professor Jane Dixon from Australian National University currently visiting the Centre for Food Policy, Professor Peter Mollinga from SOAS/LCIRAH and Professor Bhavani Shankar from SOAS/RVC/LCIRAH. More than 250 people attended the various launch events, with the live stream allowing attendees at each of the institutions to be introduced to one another. Last year more than 400 students took part in the programme that includes away days, workshops, lectures and a summer school. Participants also have access to a range of exclusive internships. We looked at issues such as how to deal with the hidden costs of food, like the cost of obesity and diabetes to the NHS that are not included in the price we pay for “apparently” cheap food. Students also learnt about the different ways of analysing complex systemic problems like anti-microbial resistance and developed policy solutions to food system challenges such as Brexit. By working with people from different backgrounds, students were able to broaden their thinking when framing problems and developing solutions. As a result, the proposals they presented were really insightful and well-rounded.